BomBassic is the musical collaboration of Brucey B and Cpt. HyperDrive. Originally from Stony Brook, New York, now based in North Carolina, Cpt. 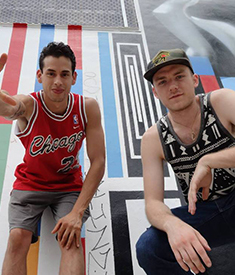 HyperDrive and Brucey B met in high school and became friends on their shared love for hip hop and music in general. Brucey formed a local hip hop group, IRD, and a few years later HyperDrive asked to join. In 2008, Brucey moved to Asheville, NC and began sending HyperDrive different types of electronic music. Both found a connection to the various genres of electronic music. Passion for innovative music and introduction to new genres and artists inspired the two to form a new group. BomBassic was born in Spring 2011 in an effort to combine their experience of production along with the limitless boundaries of electronic music. Since then they have formed a deep catalog of soul moving material that continues to evolve in style and sound.